Windows (7, 8 and 10) or Mac (OS-X 10.5 and later). It can run on laptop PCs. The software requires high graphic performance. Short range type is not suitable because it make large shadow on the spherical screen. Any white spheres or white half-spheres can be used as the spherical screen of Dagik Earth. Polystyrene foam spheres could be purchaed through the internet. You can search them with keywords, "polystyrene foam half ball" or something. 60cm diameter one is enough to be used in a small classroom. 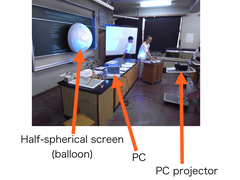 Polyethylene Balloon type half-spheric screen is portable. We order it to a local balloon factory. 1m diameter one costs about US$150. We can provide the design sheet of the screen. Please contact info@dagik.org. We can help to arrange the equipments to carry out Dagik Earth. Please contact info@dagik.org. In Japan, we can lend a set of the equipments. 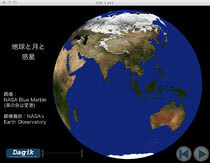 Contents (Dagik Earth software) are on "Download" page. The most file is large in size. Please try a small one, "Earth/Moon/Planets" (10Mbyte), as a trial. Files are compatible for both Windows and Mac. Contents are compressed with "zip", so expand it. A folder whose name starts "Dagik_" will be made. "Dagik_Earth.exe" and "Dagik_Earth.app" in the folder is executables for Windows and Mac, respectively. Double click "Dagik_Earth.exe" or "Dagik_Earth.app" , a window will open, and afeter a few minutes the earth image will be displayed. Maximize the window by clicking the central buttom on the top-right corner of the window (Windows) or the right buttom on the top-left corner of the window (Mac). 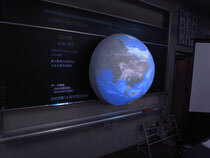 Hook the PC projector to the PC as an external display, and project the Earth image on the spheric screen. Adjust he earth image projected from the PC projector and the spheric screen. Actually, it is difficult to make a perfect adjustment, so don't mind a slight difference. (c) 2010-2017 Dagik. All rights reserved.